I used a round pan and an odd yard sale pan I acquired. I have discovered that white cake mix does not hold up well. This turned out AWFUL! I used the oval pan to make the 'boat'.... kept cracking and falling apart. 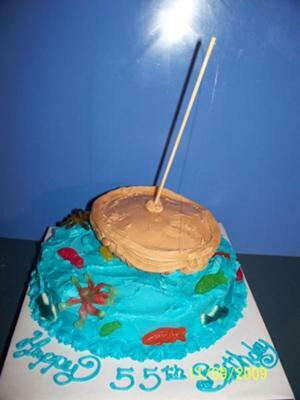 I covered the cake in buttercream colored blue and brown for the boat. I added gummi fish, big and small, gummi sharks and gummi octopus. I used a skewer and tied real fishing line on it and stuck a gummi fish on the end. That's what's sticking out of the boat. I will never try this again. I will use a toy boat or fondant or gumpaste. I was not happy with this at all.